Picture-perfect, this sumptuous and very festive main dish makes a showy presentation on the Thanksgiving holiday table. Adorned in black sesame seeds, these 12 striking globes rise up from a rosy pool of seductive cashew sauce and entice the inquisitive palate. To ease the holiday stress, have the cooked brown rice ready and make both the tornadoes and the sauce the day before. Stored them separately and assemble the dish shortly before serving. Briefly warm the tornadoes in a 350-degree F. oven and the sauce on the stovetop. Presentation is everything with this dish. It’s so simple, yet makes these sesame coated balls look amazing. Hunt for long sprigs of rosemary to poke into each “tornado.” I just know that when you bring this dish to the table, you’ll hear some very pleasing ooohhs and aaaahhhs. Present the tornadoes on a recessed platter that will hold a pool of sauce and allow you to garnish the edges. If you can’t locate black sesame seeds, roll the tornadoes in toasted or natural sesame seeds and they will still make an awesome main dish. 1. To make the tornadoes, preheat the oven to 350 degrees F. Line a 17 1/2 x 12 1/2-inch rimmed baking sheet with parchment paper and set aside. 2. Combine the mushrooms, onion, tamari, and tarragon in a large, deep skillet. Add water and cook and stir over medium-high heat for 10 to 12 minutes, or until the mushrooms are cooked and the onion is softened and transparent. Add 1 or more tablespoons of water as needed to prevent burning. 3. Transfer the mushroom mixture to a food processor and add the olives. Process until smooth and creamy, stopping occasionally to scrape down the work bowl. Spoon the mixture into a large bowl. 4. Add the rice, oats, walnuts, salt, and pepper and mix well. Pour the black sesame seeds into a deep, medium bowl. 5. 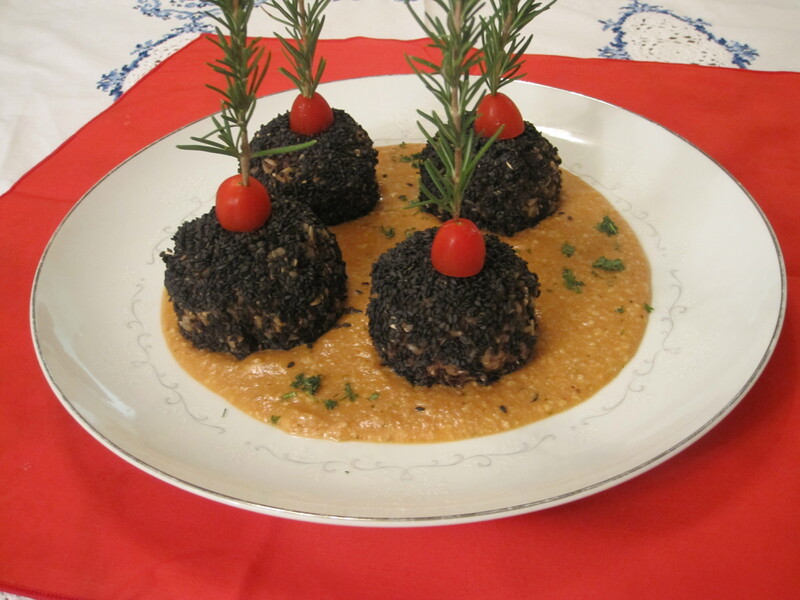 Using your hands, form the mushroom mixture into balls about 1 1/2 inches in diameter. Roll each one in the sesame seeds to coat well. Place the coated balls on the prepared pan and bake for 30 minutes. 1. To make the sauce, combine the vegetable broth, tomato paste, tamari, garlic, garlic powder, onion powder, thyme, marjoram, and cayenne in a 2-quart saucepan. Bring to a boil over medium-high heat. Decrease the heat to medium and simmer 1 to 2 minutes. 2. Add the cashews, whisk and cook for 4 to 5 minutes, or until the sauce has thickened. The sauce will continue to thicken upon standing. Add extra vegetable broth to thin the sauce as needed. Before serving, stir in the lemon juice, salt, and pepper. 3. To serve, spoon the sauce into a large, deep platter and arrange the tornadoes over the sauce. To garnish, poke a rosemary sprig into each tomato half and push them into the tops of the tornadoes, so they stand upright. Note: If not serving immediately, refrigerate the tornadoes and sauce separately. Warm the tornadoes in a preheated 350-degree F. oven for 12 to 15 minutes before serving. Heat the sauce in a saucepan over medium heat for 4 to 5 minutes. Like me, you’ve probably rediscovered an old favorite recipe that had somehow gotten lost and ended up at the bottom of a pile of papers you keep meaning to tackle. Well, actually, this little gem of a recipe didn’t end up in a pile because it’s one of the recipes in my cookbook, The Nut Gourmet. But it did kind of get lost between files in a hidden corner of my memory. An upcoming visit from my friends Vesanto and Cam from Vancouver triggered my memory to bring up that file and I’m thrilled to share this flavor-filled recipe that’s never failed to get raves. I love recipes that can be prepared in advance and still taste great when you serve them a day or two later. This one’s a winner in every way. The recipe is a unique take on a nut-filled patty that tastes great tucked into a pita, piled into a giant sandwich, enjoyed as an open-faced sandwich, or relished all by its delicious little self. You can even eat the patties cold, right from the fridge and find them perfectly flavorful. 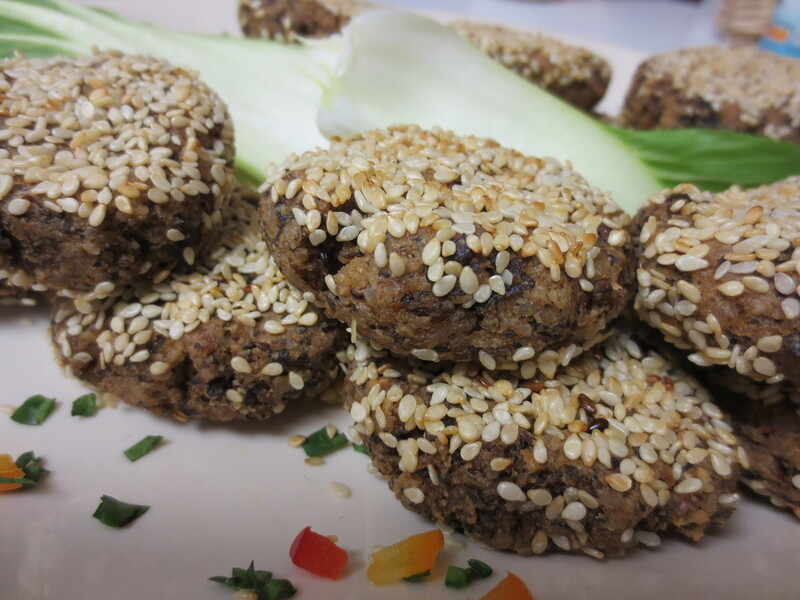 Although the sesame seeds remain on the top and bottom of the patties, they successfully impart their definitive flavor that oozes sesame with each delicious bite. Versatility works great with this recipe–you can vary the nuts and vary the grain. 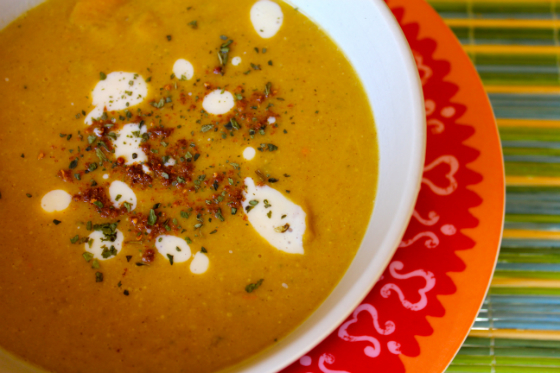 It’s an excellent recipe to fall back on when you have 2 cups of leftover cooked grains. I like the patties with a little dollop Tofu Sour Cream, but you can shmear with any of your favorite toppings. 1. Lightly oil a large rimmed baking sheet or line it with parchment. Put the sesame seeds in a medium shallow bowl and set aside. 2. Grind the walnuts, cashews, and pistachios to a coarse meal in a food processor, and leave them in the processor. 3. Combine the water and psyllium husks in a small cup or bowl and stir well to moisten. Set aside for 1 minute to thicken, then add to the processor. 4. Add the soy sauce, chili powder, oregano, nutmeg, and thyme to the processor. Process briefly until all the ingredients are well combined. 5. Add the wild rice and pulse and process until it is well incorporated. If needed, add 1 to 3 tablespoons of water to moisten the mixture. 6. Form the mixture into 1 1/2-inch balls, place them on the baking sheet, and flatten slightly with your hand. When all the patty mixture is formed, dip each of the patties into the sesame seeds, covering both sides. Place them back on the baking sheet. 7. Shortly before serving, place the baking sheet under a preheated broiler, about 3 inches from the heat source. Watching carefully, broil for about 1 to 3 minutes, or until the sesame seeds are golden. Turn the patties over with a spatula and broil for 1 to 2 minutes, or until golden. Serve with Tofu Sour Cream or your favorite sauce. NEW YEAR REFLECTIONS ON VEGAN CHRISTMAS IN A NUTTY WORLD! Well, 2013 has officially begun and I’ve been considering resolutions to help make this world a healthier, happier, and more peaceful place for humans and animals and a more sustainable one for our planet. Reflecting on the past year, I realized those ideals have been my steadfast focus. They’ve enriched my life with purpose and joy and have helped others who have stopped by to visit this cozy little vegan niche. So, I’ve settled in and look forward to another fulfilling year. Now I’m feeling a bit sentimental and want to share a smidgeon of holiday nostalgia. Vegan Christmas – two words that may not go together in every household, but in my home, it was an exceptional holiday with tender memories to cherish. Imagine all the warm and wonderful traditional winter holiday blessings, and, then, put them all together into one special day on December 25th. Bit by bit, I baked a few batches of sweet goodies, sent invitations to friends to join us for a holiday potluck, and readied the house for a comfy crowd. I knew it would be a happy occasion, but I never imagined it would be as cozy, delicious, and nostalgic as it turned out. I think there was a little vegan magic whirling in the air that day. My sweet hubby built a fire in the fireplace and lovingly tended it all afternoon. Coming in from the cold, our guests immediately gravitated toward the warm and cozy living room as they shed their coats and scarves. A boldly-spiced apple cider was mulling on the kitchen stovetop ready to offer warming comfort, while the entire house became infused with a rich medley of lively aromas. The gently simmering cider was happily sharing its generous gifts of cinnamon, allspice, cloves, and freshly grated nutmeg. Floating to the top of the cider were slices of lemon and orange contributing a subtle note of citrus. And, as if that were not enough, whole almonds and golden raisins, borrowed from my Happy New Year Glogg recipe, were also quite visible as one peered down into the large pot. I loved seeing jolly faces stretch into big smiles as I passed the tray of apple cider. Into each of the small, glass punch cups I ladled the hot cider and included a few almonds and raisins in each glass. Within a couple of hours, that cider-filled, 12-quart stockpot was nearly empty. When everyone’s potluck contribution was well warmed or perfectly chilled, we gathered around the table to fill our plates with a feast to boast about. There dishes too numerous to list. I will simply remember the tantalizing medley of savory, lemony, spicy, pungent, and sweet flavors that strolled across my taste buds. 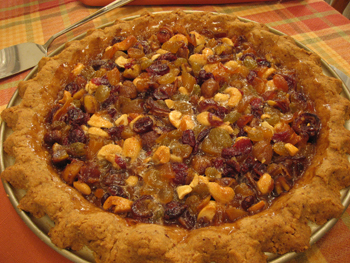 The pie crust of crushed almonds, tofu, and yams makes this a unique dish and one that was enthusiastically received. Because we were expecting about 20 people, I thought it would be best to triple the recipe and prepare it in a large rimmed baking sheet. It was the perfect amount and allowed for extra helpings. While assembling the pie, I realized this is not a dish that’s just for Christmas. It’s a charming recipe that can be enjoyed year round because the ingredients are readily available no matter what season. During summer, when green tomatoes are available at the farmstand, they can be substituted for ripe ones or intermixed, creating an appealing red and green theme. This is one honey of a make-ahead dish, even up to two days ahead. To serve, remove the dish from the refrigerator, bring it to room temperature, and warm in a preheated 350-degree F. oven for about 15 to 20 minutes. Cut into serving pieces and enjoy. Melt-in-the-mouth delicious and decked out for the festivities, this attractive Italian-inspired dish makes an ideal savory dinner pie with a unique crust. 1. Preheat the oven to 350 degrees F. Light oil a 9-inch pie pan. 2. To make the crust, put the sweet potatoes in a 2-quart saucepan with water to cover. Cover and bring to a boil over high heat. Decrease the heat to medium and simmer for 5 minutes, or until the sweet potatoes are fork-tender. Drain the sweet potatoes well, transfer them to a large bowl and mash them well. Set aside. 3. Put the almonds in a food processor. Process until they are finely ground yet still retain a little texture. Add the tofu and salt and process until well incorporated, stopping occasionally to scrape down the work bowl. Spoon the tofu mixture into the bowl with the sweet potatoes and mix well. 4. Spoon the sweet potato mixture into the prepared pan. Use your fingers to press it onto the bottom and up the sides of the pan. Build up the sides of the crust 1/2 -inch higher than the pie pan. Bake the crust for 15 minutes and let cool. 4 to 5 large red or green tomatoes, seeded and sliced. 1. 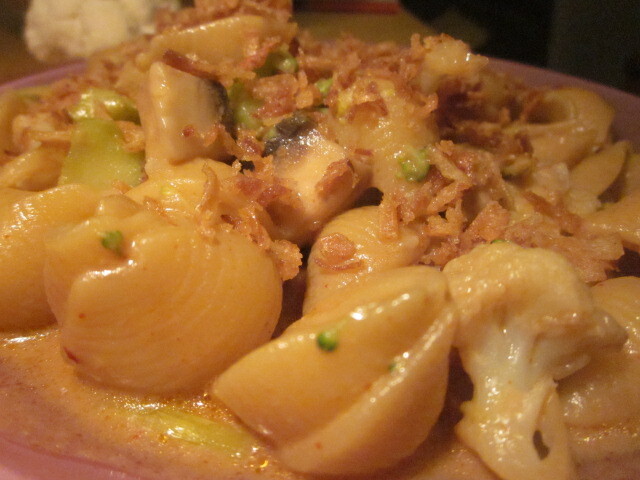 To make the filling, put the green onions, garlic, pine nuts, and Homemade Parmesan in individual bowls. Sprinkle the cornstarch on a plate. 2. Cover the bottom of the crust with one layer of eggplant slices. (This prevents the crust from getting soggy). Reserve remaining eggplant for another use. Sprinkle the eggplant slices with salt and pepper. 3. Dredge one-third of the tomato slices in the cornstarch. Arrange the dredged tomato slices over the eggplant, filling all the spaces with small bits of tomato. Sprinkle lightly with salt and pepper. Sprinkle one third each of the green onions, garlic, pine nuts, and Homemade Parmesan over the tomatoes. Repeat the process to make three layers. 4. Bake for 45 minutes. Let cool 10 to 15 minutes before serving. Note: If using green tomatoes, the pie might have to hake another 15 minutes. Often I’ve come to rely on a sprinkle of vegan Parmesan to add sparkle to a dish, soup, a casserole, or an appetizer. With only five ingredients, this recipe is almost instant to make and tastes enough like the real thing to put the Italian touch on everything from pizza to minestrone and a host of holiday or everyday dishes. 2. Add the nutritional yeast, onion powder, salt, and garlic powder and pulse until well mixed. Transfer to a covered container and refrigerate until ready to use. Covered and refrigerated, Homemade Parmesan will keep for 3 months. MOUTH-WATERING MAIN DISHES FOR CANADIAN THANKSGIVING! Guest host Kathy Hester brings scrumptious slow cooker main dishes to the Thanksgiving table that can be prepared without last minute stress. Kathy blogs at The Healthy Slow Cooker where you can find tasty, from-scratch recipes and helpful advice on choosing just the right slow cooker for you. 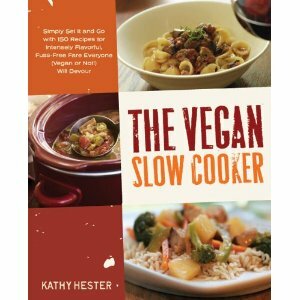 Kathy is the author of The Vegan Slow Cooker Book and when she’s not cooking, she develops recipes and does free-lance writing for several blogs like One Green Planet as well as magazines. Look for her new, not yet published cookbook The Great Vegan Bean Book. Every family seems to have a special recipe for sweet potato casserole. This one is less sweet than the sticky sweet casserole of my youth. It skips the caramel and marshmallow sometimes included. You could add vegan versions of both in if you really want to. 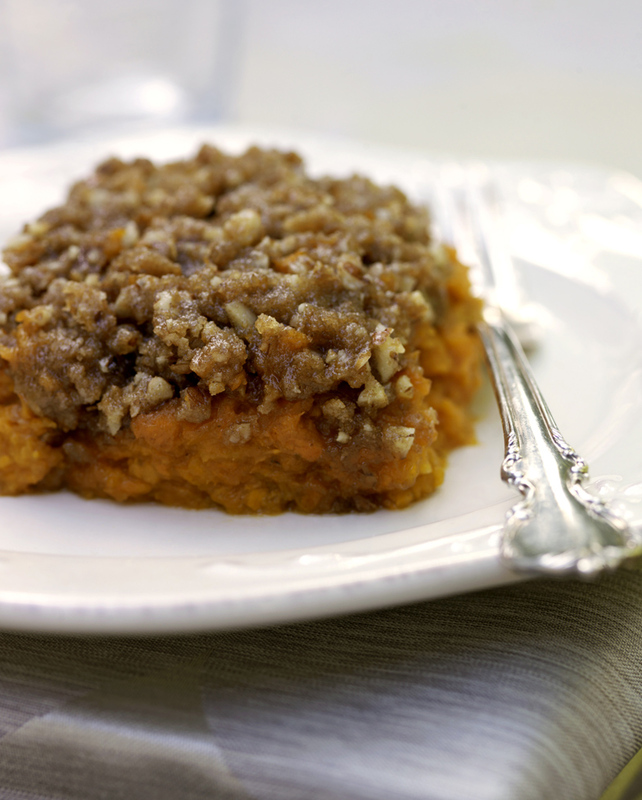 After all, any day is a holiday when you get to eat sweet potato casserole! The night before: Cut sweet potatoes. Make the topping by combining the ingredients and mixing thoroughly. Store topping and sweet potatoes in fridge overnight. Chop pecans and store in a covered bowl, unrefrigerated, overnight. In the morning: Add sweet potatoes and water to an oiled crock. Cook on low for 6 – 8 hours. 30 to 45 minutes before serving: Turn slow cooker to high. Mash sweet potatoes in crock. Add spices and part of the non-dairy milk. Add the rest of the milk if the potatoes are still too stiff, but leave out if they are runny. Drop spoonfuls of pre-mixed topping. As the topping begins to melt, spread with the back of a spoon across the top to make it more even. Serve once the topping is melted and the dish is heated throughout. I seem to be on a streak of ugly but packed-full of flavor recipes this month. I guess the veggies that are available in January aren’t quite as flashy as some of the summer ones. That, and well, stews aren’t always pretty – but you can’t beat a one dish meal for an easy dinner. In my next incarnation, I think I’ll add a handful or two of chopped greens to shake things up a bit. You can really add any veggies you have on hand, too. I’m all about options and using what you have on hand. 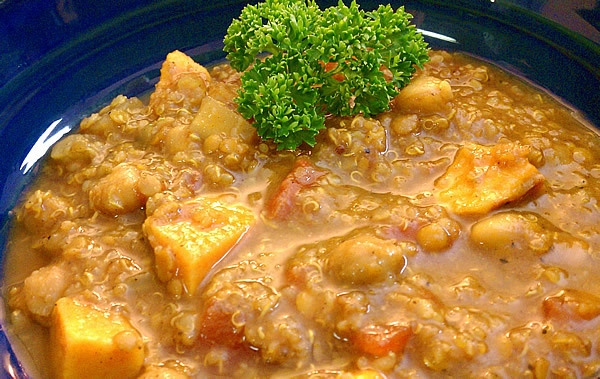 Yellow lentils instead of red, potato in place of turnip, and even carrot would all work just as good as the listed ingredients. The night before: Chop veggies and store in the fridge. This is a good one to make if you are going to be away from the house a little longer than usual. If your slow cooker runs hot add a little extra water if it will be cooking longer than 9 hours. 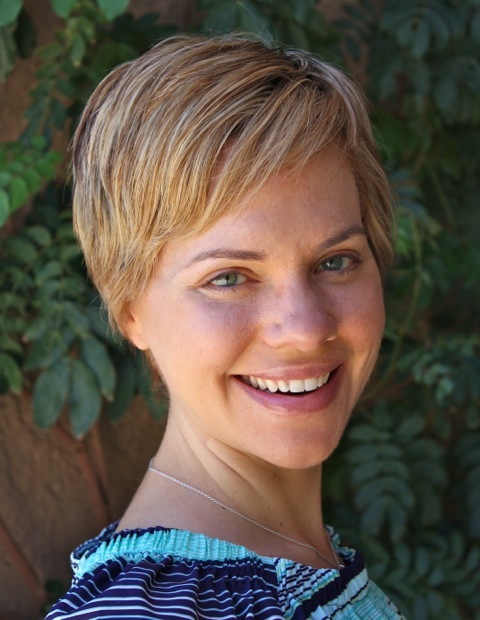 Guest Host Carrie Forrest is a graduate student in public health nutrition and the author of the blog Carrie on Vegan. Through her writings, step-by-step photo guides and recipes, Carrie inspires readers to prepare plant-based recipes that are 100% delicious. Carrie firmly believes that superior health is achievable through nutritional excellence and specializes in whole-food, simple recipes that are low in added fats, sugars and salt. I think fall might be my favorite season. I love the coolness in the air and the transition to warmer clothes. As a homebody, I like the shorter days that force me indoors to cook, read books or just cozy up to the fireplace. What I love most of all about fall is the introduction of fall fruits and vegetables, and butternut squash heads the list. Tips: If you cannot find pumpkin pie spice, use ground cinnamon instead. A medium butternut squash will weigh 2 to 3 pounds. 1. Peel, seed, and cube squash. 2. Chop onion. Slice mushrooms. Mince garlic. 3. In a large pot, bring water to a boil. Add onions and cook for a few minutes over medium heat. Add mushrooms and cook until softened. Add garlic, pumpkin pie spice, no-salt seasoning, and oregano. Stir in butternut squash and vegetable broth. Add water if necessary to cover vegetables. 4. Bring soup to a boil. Reduce heat to low, cover, and simmer for 20 minutes or until squash is tender. 5. Rinse and drain beans. Stir into soup and cook just long enough to heat through. Remove from heat. Using a hand immersion blender, process stew to desired consistency. Stir in Vegan Cream Sauce and serve hot. This sauce is the equivalent of heavy cream and can be stirred into savory soups and stews to add richness and flavor. I love using it in my Harvest Butternut Stew. Tip: I use soy milk in this recipe for an extra creamy texture, but you can substitute your favorite non-dairy milk. Combine cashews and non-dairy milk in a high-speed blender and process until smooth. Refrigerate for up to 3 days. Nicole Abramowski, blog host of Vegan Nom Noms, says few can resist a melt-in-the mouth taste of vegan mac-n-cheese, especially on special holidays when food favorites are a must. Smith Graduate Nicole loves to sample life in far away places and has lived in England, the Czech Republic, Massachusetts, and now resides in Berlin, Germany, a place she has discovered is a vegan paradise. At Vegan Nom Noms shares recipes, food photography, and all things cool. This is probably my most-requested recipes by non-vegans whenever I make it for the holidays. Though there are more vegan mac-n-cheese recipes than you can through a stone at out there on the interwebz, this one has pretty basic ingredients, no need for a blender and is super addicting. I even served it to my very non-vegan family at Thanksgiving, including extended relatives, and several of them commented on how good it was and gobbled it all up. Surprise, it’s vegan! Every year I have a phase where I eat this every week for a few months. I’m pretty sure I will become a mac-n-cheese one day. There’s nothing better, now that the cold is creeping in, to curl up with a bowl of noodley saucy goodness! Nutritional yeast, please marry me. Preheat oven to 350 degrees F (180 degrees C). 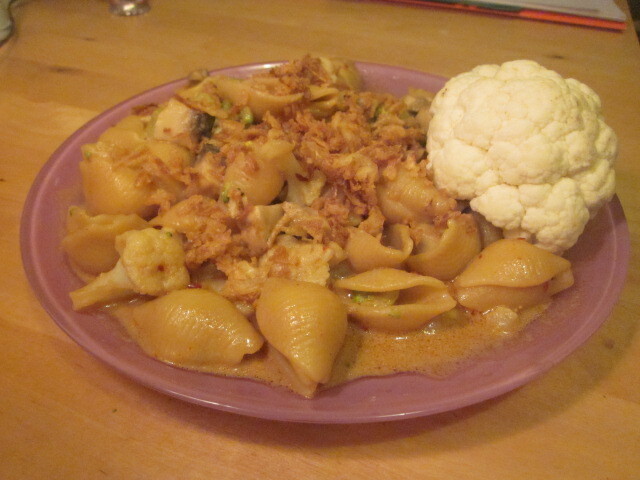 Boil water in a medium-sized sauce pan and cook pasta (I like to use shells for this dish). While pasta is cooking, combine everything but the french fried onions in a large bowl and mix together. Try and break up the margarine chunks as much as you can, but they’ll just melt in the oven when it’s cooking so it doesn’t need to be perfect. You can put the veggies in frozen, they’ll cook in the oven too. Once the pasta’s done, drain and add to the “cheese” sauce. Stir until all the pasta is covered and then pour into a baking dish and top with the french fried onions. Bake uncovered for 25-30 minutes until onions are browned and top of the pasta looks crispy. Eat and enjoy! Today’s tempting Canadian Thanksgiving recipes come from a true Canadian who lives in Ontario. Lisa Turner, a vegetarian for 22 years, knows how to treat a vegetable with love and creativity. In these irresistible recipes she incorporates a medley of flavors, colors, and textures to reflect the foods of the harvest celebration. Lisa blogs at Lisa’s Kitchen where she specializes in Indian cooking with vibrant flavors and dazzling colors. Lisa’s recipes for Canadian Thanksgiving are just as delectable for our U.S. Thanksgiving. Making a healthy vegetarian entrée look like a gourmet dish isn’t the result of elaborate and technical procedures. Rather, it’s the product of quality ingredients, simple but appealing food combinations, and inviting contrasts in color and texture, all assembled with care, attention, creativity and a love for food. Of course, a fancy menu-style name might impress your guests as well! This lovely meal, for example, is no less elegant and delicious for all its true simplicity and ease. Tender roasted golden orange butternut squash is mixed with a baked casserole of creamy cannellini beans, delicate artichokes, sweet cherry tomatoes and fresh herbs, and served with a fresh crunchy and slightly tart fennel and parsley salad for a meal that is stunning for its visual appeal, wonderful taste and wholesome nourishment … all with no more than twenty minutes of preparation, apart from the roasting time, and only a little attention and care during the cooking. As is so often the case when I cook with squash, I was inspired by the fact that I could no longer stand looking at the uncooked squash that I picked up on a whim a little while ago and that just sat forlornly in my pantry ever since. I adapted the recipe itself from one given by a self-described “Dog Shaman” from South Africa who otherwise advocates a vegan diet for dogs. I don’t endorse canine veganism myself (and I know my cat would strongly disapprove of a feline equivalent), but I’m quite happy to try his human food. • Rinse the beans and soak overnight covered in several inches of cold water with a little lemon juice added. Drain and add to a medium saucepan. Cover with fresh cold water or vegetable stock, and bring to a boil. Immediately reduce the heat to low, cover, and let simmer for 1 to 1 1/2 hours or until the beans are soft. Drain and mash gently with a potato masher. Set aside. • Prepare the salad in advance to allow the lemon juice and olive oil to mellow the strong flavour of the fennel. Combine all the salad ingredients in a bowl and toss gently. Set aside at room temperature, tossing again occasionally. • Pre-heat an oven to 400°. Prepare the squash by cutting in half lengthwise, scraping out the seeds, and scoring deep crosses at bite-sized (about 1-inch) intervals into the flesh. Place the halves on a baking sheet open side up and drizzle the squash with olive oil, a few sprinkles of water, rosemary, thyme and fresh ground black pepper. Place in the oven and roast for 40 to 50 minutes or until the squash is tender and browned. • Meanwhile, combine the beans, artichokes, tomatoes, wine, basil, oregano, salt and pepper in a small oven-safe casserole dish. Drizzle with olive oil. After the squash has been roasting for 10 to 15 minutes, place the casserole dish uncovered in the oven beside the squash and bake for 20 to 30 minutes or until the liquid has evaporated and the beans are still moist but not dry. Remove from oven and set aside until the squash is finished. 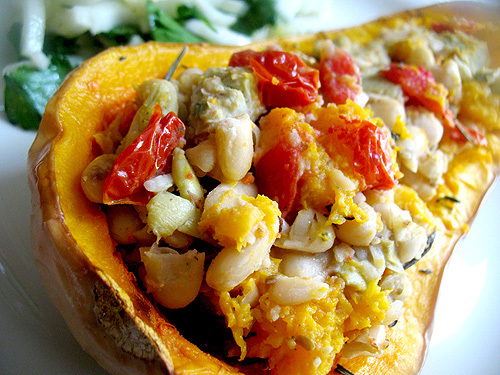 • Remove the cooked squash from the shell and stir into the bean mixture. 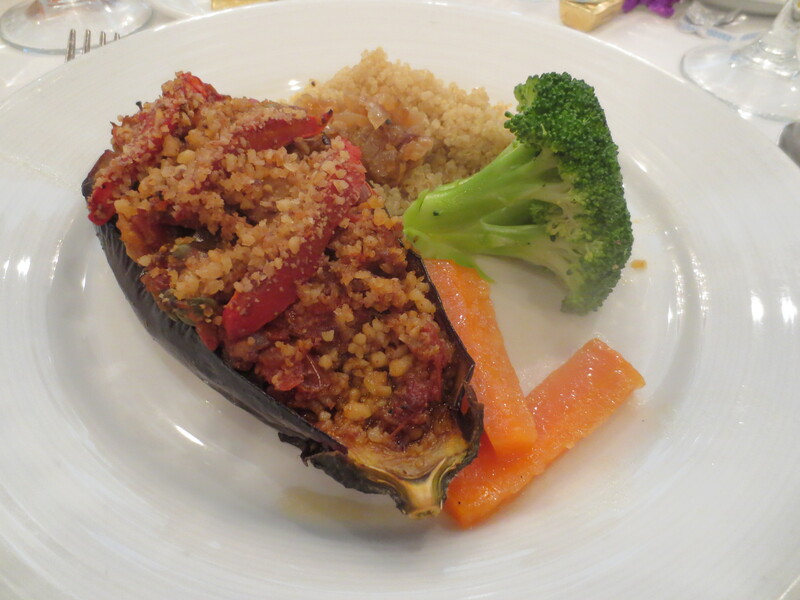 If using, scatter the vegan Parmesan cheese on top and place the casserole dish under the broiler for a minute or two. • Toss the fennel and parsley salad one more time and serve with the squash, cannellini and artichoke mixture. For an added special touch, reserve the squash shells and scoop the squash, cannellini and artichoke mixture into the shells for serving. Considering it seems that I put hot chillies and/or jalapeños in pretty much everything I make, my regular readers might be surprised to learn that my very favorite cornbread consists of little more than cornmeal. But my regular readers will also know that I love the sweet taste and crunch of cornmeal, and this dense and filling bread will satisfy any cornmeal craving. 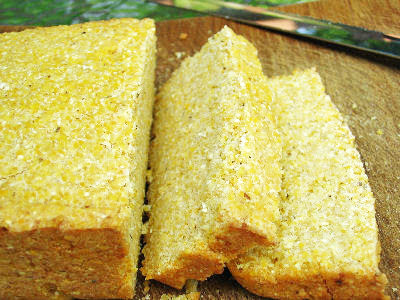 For a satisfying snack, serve slices of this cornbread with a bit of vegan butter. It also goes well as a side with any spicy Mexican meal. Simple, dense and filling, classic cornbread loaded with plenty of cornmeal flavor and crunch — a great snack or addition to Thanksgiving or a spicy Mexican meal. • Preheat an oven to 325° and grease a loaf pan with oil. • Combine the cornmeal, flour and salt in a large bowl. If you are using a dry sweetener, mix in to the dry ingredients. Add the oil and rub it into the dry ingredients with your hands. If you are using a liquid sweetener, add it now and stir to combine. Gradually stir in the water until the mixture resembles a thick cookie dough — you may not have to use more than 2 cups of water. • Heat the prepared loaf pan until hot but not smoking. Transfer the batter to the pan and bake for 30 minutes. Increase the heat to 350° and bake for another 50 to 60 minutes or until the bread begins to brown and small cracks form on the top of the loaf. • Remove the bread from the oven and cool on a metal rack for 10 minutes. Gently remove the loaf from the pan and cool for another 30 minutes on the rack. Cut into 3/4-inch to 1-inch slices and serve. CANADIANS CELEBRATE THANKSGIVING DAY OCTOBER 8! Canadian Thanksgiving is coming soon and I wanted to offer our friends to the North some tasty, festive recipes for their celebration of the early harvest. Canadians celebrate Thanksgiving on the second Monday in October. This year their celebration falls on Monday, October 8, just two weeks away. 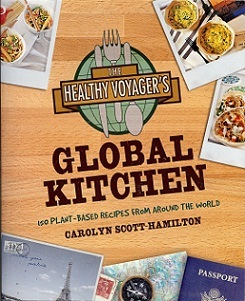 In the next couple of weeks, I’ll be posting several delectable recipes for Canadian Thanksgiving from a number of guest contributors, vegan bloggers who really know how to dish up lavish, mouth-watering foods that will make the harvest celebration for our Canadian neighbors just as special as our November holiday. Following is a very unique main dish from my book, Vegan for the Holidays. The stunning entree borrows its beautiful structure from a traditional Moroccan dish called bistilla. Stately, delicious, and aromatic, this is the dish that will change the minds of those who snicker at the thought of a vegan thanksgiving dinner. Like a typical Moroccan Bistilla, this delicious entrée is completely encased in phyllo dough. Uniquely different is the plump filling of whole grains, nuts, vegetables, and all the herbs and spices that say Thanksgiving. Prepare the filling a day in advance to make assembly more convenient. 2. To make the filling, combine 3 1/2 cups of the water, rice, barley, and 1 1/4 teaspoons of the salt in a 3-quart saucepan. Cover and bring to a boil over high heat. Decrease the heat to low and cook for 50 to 60 minutes, or until the rice and barley are tender and all the liquid has been absorbed. 3. 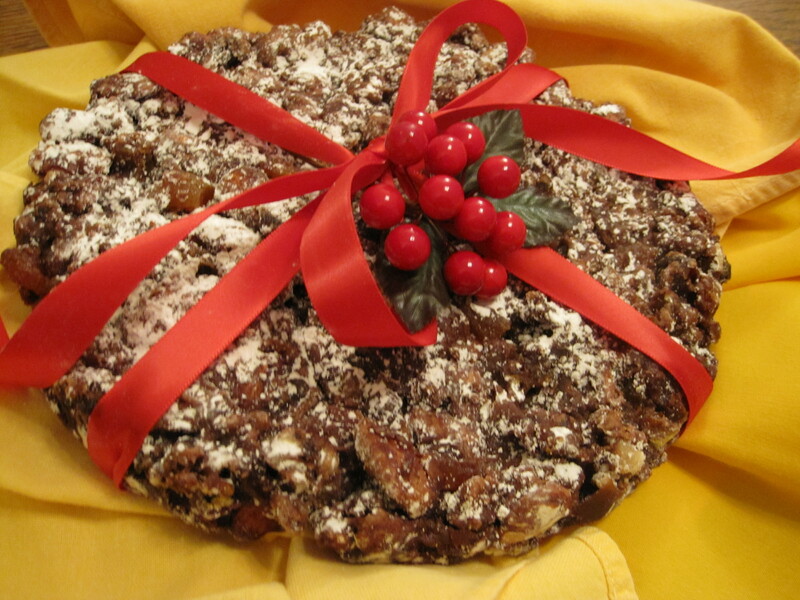 Meanwhile, place the almonds, walnuts, and pecans in a single layer on a 17 1/2 x 12 1/2-inch rimmed baking sheet. Bake for 8 to 10 minutes, or until lightly toasted. Immediately pour the nuts onto a plate to cool. 4. Put the potatoes in a 1-quart saucepan with water to cover. Cover and bring to a boil over high heat. Decrease the heat to medium and simmer 5 to 7 minutes, or until the potatoes are tender. Transfer the potatoes to a medium bowl with a slotted spoon and mash them. 5. Cook and stir the mushrooms, onion, bell pepper, carrots, celery, garlic, sage, cinnamon, allspice, thyme, marjoram, rosemary, and the remaining 1/4 cup water in a deep, 10 to 12-inch skillet over medium-high heat for 12 to 15 minutes, or until the vegetables are softened and beginning to brown. Add 1 or more tablespoons of water as needed to prevent burning. 6. Add the tomatoes, zucchini, raisins, chickpeas, the remaining 1 1/4 teaspoons salt, and pepper to the skillet, Cook another 10 minutes, or until the tomatoes are broken down. 7. Add the rice mixture, toasted nuts, and mashed potatoes to the skillet and mix thoroughly. Adjust the seasonings and set aside. 8. To make the crust, place a dish towel horizontally on your workspace. Unroll the phyllo dough and place it on the dish towel. Cover it with another dish towel to prevent the phyllo from drying out. (Each time you remove a phyllo sheet, cover the dough with the dish towel.) Pour the canola oil into a small bowl and place it nearby. Lightly oil a 10-inch ovenproof skillet. 9. Remove one sheet of phyllo from the stack, and place it into the prepared skillet, allowing the ends to drape over the side of the skillet. Gently brush the phyllo with oil, including the portion that drapes over the side. Repeat with eight more sheets of phyllo, draping each of the sheets in a different direction to form a circle around the skillet. 10. Spoon the filling into the phyllo crust, packing it firmly. Lift up the edges of the draped phyllo sheets and place them over the filling. Place the remaining three sheets of phyllo on top of the pie, one at a time, brushing each with the oil. Tuck the ends of the three sheets down into the sides of the skillet. Bake for 50 to 60 minutes, or until the crust is golden. 11. To serve, invert the pie onto a large serving platter or tilt the skillet to slide it onto the platter. Garnish the top with the cinnamon, pistachios, and mint and place the tomato rose in the center if desired. Cut the pie into wedges with a serrated knife and remove each wedge with a pie server. VEGAN FOR THE HOLIDAYS ARRIVES WITH GOOD CHEER! My shiny new cookbook, Vegan for the Holidays: Celebration Feasts for Thanksgiving through New Year’s Day, has formally arrived this month and I couldn’t be more excited! It’s a beauty! After a few years of dabbling in a fun and deliriously wild exploration of holiday kitchen alchemy, I gathered up my multitude of little pieces of paper and tiny recipe notes and popped them into the oven. And –would you believe–out popped this beautiful book of recipes for killer-delicious celebration dishes! 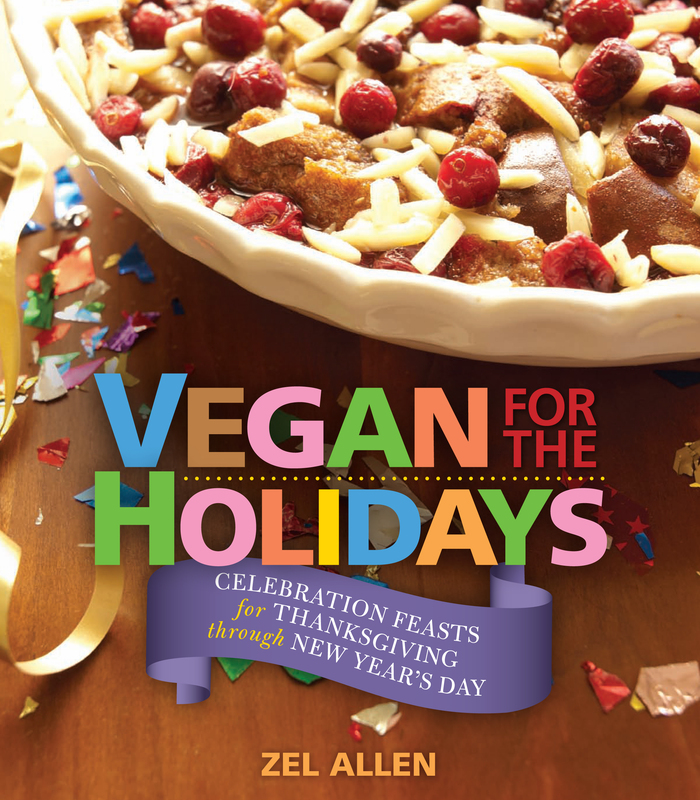 Vegan for the Holidays makes Thanksgiving through New Year’s Day a divine season of grand feasting. Vegans need never feel deprived and never have to resort to a mere salad while others at the Thanksgiving table chatter enthusiastically about the turkey. 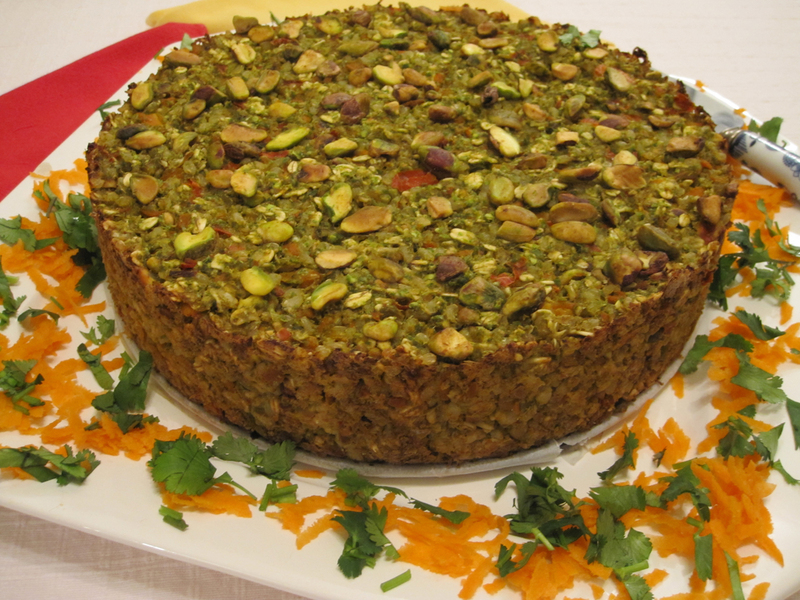 Now we can feast on awesome dishes like Savory Lentil Terrine with Mushroom-Wine Sauce or Pistachio and Sweet Pea Torte with Roasted Tomato Aioli. 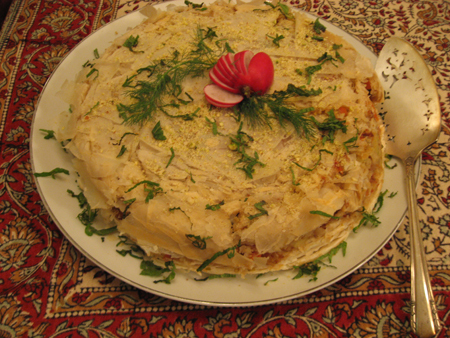 Perhaps, the Thanksgiving Phyllo Pie will be the centerpiece dish at your family celebration. Bask in the sweet paradise of Santa’s Favorite Panforte for Christmas or rich and savory Potato Latkes and Vegan Sour Cream for Hanukkah. Dine on sumptuous servings of Mac ‘n’ cheese and Jamaican Jerk Tofu for Kwanzaa. Conclude the year with the dazzling, sweet and spicy Apricot, Date, and Hazelnut Sticky Pie on New Year’s Eve or New Year’s Day. 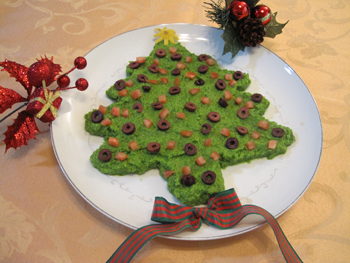 Here’s an easy holiday appetizer that puts yuletide spirit on a plate and unveils your hidden talent as a sculptor. Make it mildly spiced or crank it up to muy picante with extra jalapeno chiles and a pinch of cayenne. Just remember to thaw the peas, then you’ll be ready to let the food processor do the work. 1. Put the dip ingredients in a food processor. Process until smooth and creamy, stopping occasionally to scrape down the work bowl. 2. Spoon the mixture onto a large platter and use the back of a spoon to form the mixture into the shape of a large Christmas tree. Decorate the tree with the bell pepper, carrot, and the optional green onion. Place the star anise at the top or arrange the cloves into a radiating star. Serve with baked tortilla chips, bean ships, toasted pita wedges, or your favorite crackers.